Fortress Of Freedom Board :: View topic - Becel Ride For Heart 2011! Becel Ride For Heart 2011! Posted: Wed Jun 08, 2011 12:38 am Post subject: Becel Ride For Heart 2011! 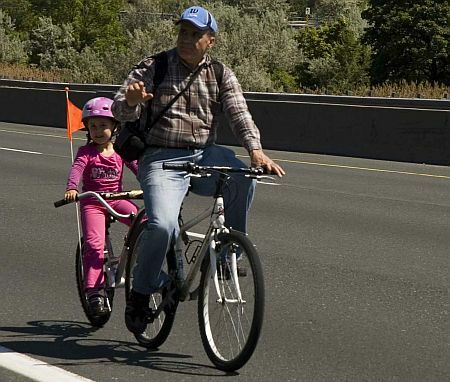 June 5, 2011 - Toronto, Canada: Thirteen thousand cyclists collected 4 million dollars during the yearly "Becel Ride For Heart" which is an event to collect funds for heart and stroke research. 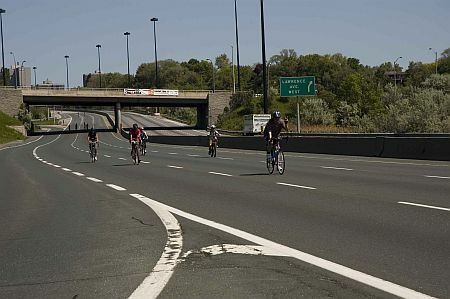 This year the ride started at several places and at several lengths of rides, mostly on the Gardner Expressway and the Don Valley Parkway. 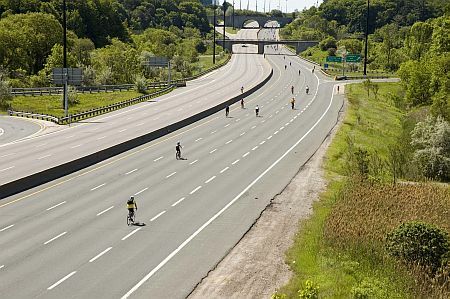 A freeway with nothing but bicycles on it! I arrived about 11:30 in the morning and found only the southbound lanes were in use and the northbound lanes had already been closed to cyclists. Officially the ride ends at 2:00 when the roads open to regular traffic. 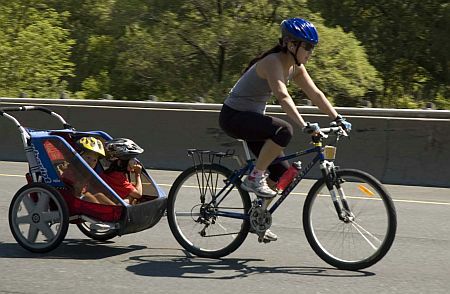 You saw all sorts of riders and bicycles at this event all experiencing traveling on a freeway open to nothing but bicycles! There was the occasional police car and a bus that picked up anyone too pooped to continue. There were also refreshment stations with drinks and fruit. More so than in other years was the cry from car owners to stop the closure of traffic for marathons and rides like this. However the Becel ride has some history to it and those calls were not so loud this Sunday as they were with other events with less of a history behind it. Nothing but the open road ahead! Personally I have had my share of medical difficulties and the goals of the "Becel Ride For Heart" are honorable and I fully support them. The few hours of road closure on a Sunday do not really impact anyone to an enormous degree. So I will look forward to the 2012 "Becel Ride For Heart" and another injection of much needed money for more research! From files of Kevin Adgey.